It hurts! Get a Sak Yant blessed tattoo is not for everyone! However, every drop of sweat, every deep breath I took, and the pain I felt were worth. A Sak Yant bamboo tattoo is not about beauty or fashion. It´s a blessed Buddhist tattoo, with magical powers and commitments, a unique spiritual experience we had in Chiang Mai, Thailand. I was the first one to do it. I knew that if I watched Rob being tattooed I might give up on doing mine. With all respect I sat in front of the monk and pointed where I would like the tattoo. I was shaking, like a feather in a windstorm. Until that moment I didn’t know the design of my Sak Yant blessed tattoo. My heart trusted Ajarn Rung, and what he had choosen for me, but my body was shaking, a mix of anxiety and fear. Rob hold my hand, I closed my eyes, the silence filled the place. Suddenly I heard a few whispers, a soft hand touching my back and an even softer voice asking if I was ready. That was the moment the needle ripped my skin. That was the moment the magic begun! I could feel every punch, the ink penetrating deep in my skin. I felt pain!! But in less than a minute I stopped shaking, I was breathing normally, and all the anxiety and fear were gone. It felt warm, happy… I felt blessed!!! It took 15 minutes to finish my Sak Yant blessed tattoo. In my back, under my right shoulder, I have a “Mongkut Kaew”, that can be roughly translated into “Crystal Crown”. Ajarn Rung [the monk who does the Sak Yant tattoo] choose this design based on our talk, on what I want to protect in my life, and on what he perceived from my aura and energy. It´s a personalized drawing, a modified version of a pre-existing tattoo. From now on I’m blessed with good health and love in my relationship. And I truly believe on this! So, How to get a Sak Yant Blessed Tattoo in Thailand? Our Sak Yant bamboo tattoo was very meaningful, a unique experience for us. That’s because we did it with people who understand the culture and respect the traditions. A simple bamboo tattoo can be done in many studios across the country, but the blessed Sak Yant tattoo is done by few monks, and for foreigners is hard to find the right place. That´s why we decided to do the Sak Yant tattoo with the help of Ian and Alex from Where Sidewalks End. They guided us into the Lanna Ink Experience, into the world of blessing tattoos, northern Thailand culture and spiritual experiences. Couldn’t ask for better guides. If you are like us, conscious about safety issues, responsible tourism and really want to connect with local culture, do your Sank Yant tattoo with them. We strongly recommend those guys, doing a tattoo is a big decision, it will stay forever on your skin. So better be a blessed one, not a curse that you will regret for life. Where to do a Sak Yant Tattoo in Thailand? You can get a Sak Yant tattoo in many places around Thailand. We did our Sak Yant in Chiang Mai, the heart of Lanna culture, the perfect place to do learn about the story and superstitions behind the tattoos. To find the right place and the best Ajarn [the monk who does the tattoo] you need to know the right person, someone that can guide you, that can explain the meanings, and the most important thing: will help you to understand and respect this ancient culture. If Chiang Mai is not on your travel plans [what is a shame, the city is amazing and has so many interesting things to do and see] you still can get you blessed bamboo tattoo in the Thai capital. The team of Where Sidewalks End have the Sak Yant Experience in Bangkok too. Most of the tattoos are done inside the temple. Here in Chiang Mai it was inside a Sannak, a different kind of temple used more for tattoo, blessings, spiritual treatments and cure. The Sannak we went is outside the city, a few minutes driving from Chiang Mai old town. It´s a very simple place, full of Buddha images, some offers and peace. Surrounded by trees, chickens and birds, the place is completely different from any tattoo studio we have ever been. There are no chairs or sterile materials, but truly welcoming and magical vibe. Is Sak Yant safe? Is it safe to do a blessed bamboo tattoo? This is the first question people ask us, specially the ones that have never done a tattoo or have never been in Thailand. The answer is NO!! Do a tattoo is not safe in general, doesn’t matter if you are doing a traditional machine tattoo, if it will be a bamboo tattoo or even the blessed tattoo. Said that, let’s explain the facts. Any kind of tattoo involves needles, blood, inks, flesh and trustworthiness on who is doing it. Find the right place and right person to do the tattoo is the key. As the Sak Yant tattoo is done inside temples, don´t expected the cleanest and sterile place. That´s why is so important to know where to do, and trust the Ajarn who is doing it, he is the one responsible to keep the needles clean, to do the natural ink and to bless you. Remember, Sak Yant tattoo is not about beauty or perfect designs, it´s a cultural and spiritual experience. You must understand that before having the bamboo inking your skin. Who can do the Sak Yant Tattoo? Can women get the blessed tattoo? Yes, Yes, Yes… Any person can receive the blessed tattoo, even woman can do the Sak Yant tattoo, no problem. The Buddhist rules say that a monk can’t touch a woman [and the girls should not touch a monk either], so the number of Ajarns willing to do the Sak Yant on women is small. Another thing, most of the monks will not allow taking photos while tattooing a woman, that`s why we have no photos of me receiving the tattoo. Another important thing to remember, for Thai people the Sak Yant tattoo is very powerful and has meanings beyond our “western” understanding. Many people decided to do the tattoos as a cure for health problems, or as a way to protect the family, to bring luck… So when doing the Sak Yant you must act with respect. Respect to the place, respect to the monk and to the other people that are in the temple seeking protection and blessing. It´s not a tourist attraction, neither a souvenir. How to choose the perfect Sak Yant tattoo design? What are the meanings of a Sak Yant blessed tattoo? For me this is the most important and meaningful part of the whole Lanna Ink Experience. You don´t choose the blessed tattoo, the Sak Yant chooses you! 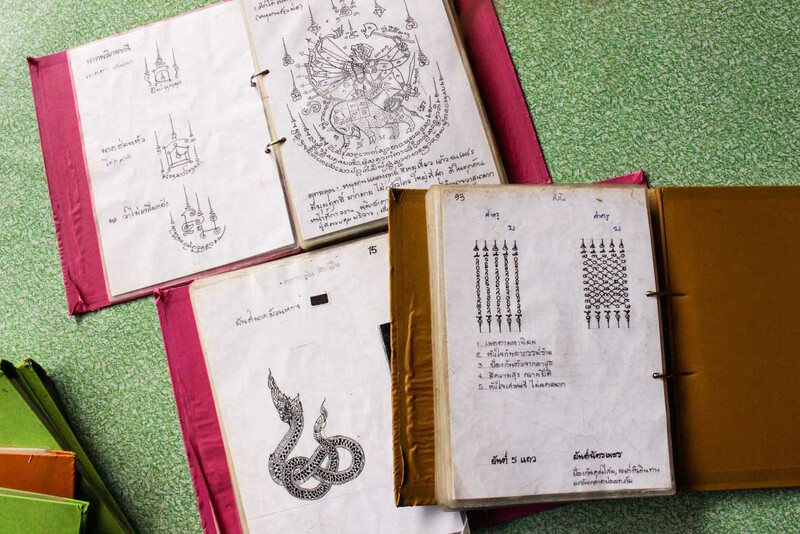 At the Sannak our guide handed us some books filled with ancient drawings, many Sak Yant designs that dates back several generations. To be honest, some of them were quite bizarre while others are so beautiful that hypnotize you. The Ajarn doesn’t speak much English so we had a local guide to translate the conversation. I looked into the books and found a drawing that I liked. So I asked what it was for, what type of blessing it would bring to my life. The answer was: to avoid hate! The Sak Yant design was pretty but didn’t match with my need. So I decided to open my heart to the monk, and let him decided what my Sak Yant design should be. There are two things that I care the most in my life: my relationship with Rob and my health. My mum passed away in 2012, after 9 years fighting against breast cancer. I also lost an aunt because of the disease, so I know I have to look after myself and pray. I told all this to the Ajarn, he thought for a moment, and after a few minutes he told me he knew what my Sak Yant drawing should be. And I trusted him! Rob was different, he looked into the books, found one he liked, and the meaning was exactly what he was looking for. That´s why it is such a unique and spiritual experience. Your moment choosing your Sak Yant design might be completely different from ours, more intense or more relaxed… But for sure it will be magical! Don’t worry, and trust the monk, Buddha know what is better for you. Does the Sak Yant bamboo tattoo hurt? The Sak Yant is more painful than the machine one? Yes, it hurts!! For some people it’s freaking painful, for me and Rob it wasn’t that much. I would say that it`s a different pain if compared to the machine tattoo. It´s a punctual pain, you feel the needle going inside your skin, like a sequence of stabs. But it´s fast, precise and no blood. For me it was less painful than the traditional tattoo I did on my back/ribs. Sak Yant Blessed Tattoo Rules! What happens if you don’t follow the rules? People believe that if you break the Sak Yant rule you might get possessed by the tattoo [by the meaning of it, or the animal, or character that the tattoo represents]. Although, our guide and the Ajarn told us that part of it is just psychological reaction. What most people agree is that if your break the first three rules you lose the power of your tattoo. All the blessing and magic will disappear. » Chiang Mai is one of the biggest cities in Thailand, and it’s famous for the nature and Buddhist Temples [there are over 300 temples in the city]. All the details about what to do, where to stay in Chiang Mai, best hotels, how to get there and weather information you can find on the post Unique Things to do in Chiang Mai! » If you are on a hurry and want to have a quick look at hotels in Chiang Mai, use these two links: Agoda & Booking.com. They are perfect for search the best offers and the best hotels in Chiang Mai. » Are you a blogger or a full-time traveller? We have you covered! We wrote an article talking about the how Chiang Mai became the official address for digital nomads. Why Chiang Mai is the place to be, and why the digital entrepreneurs and expats love it. » Still have some doubts about how to do a Sak Yant, all the rules and the safety issues. Don´t think twice, leave your questions on the comments, or go to the Where the Sidewalk Ends website, with them you will be safe and sound! Love this post?! 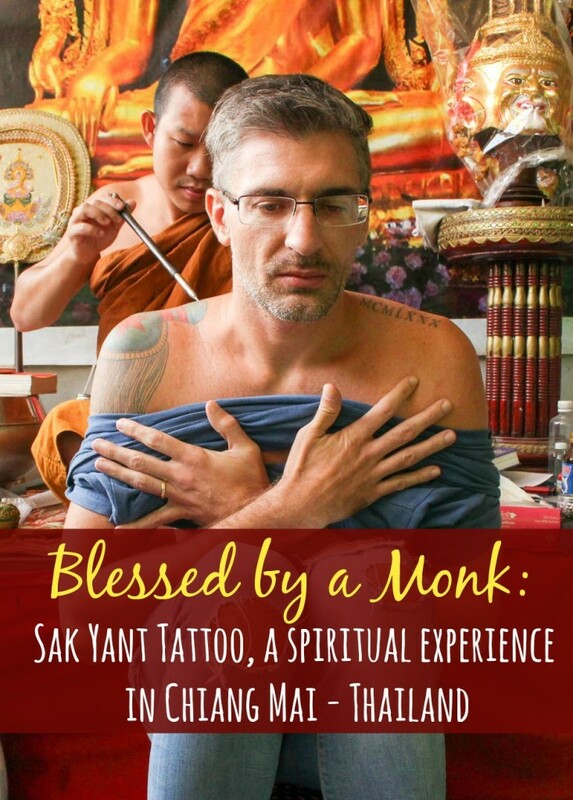 Wanna do a Sak Yant blessed tattoo ?! Did we answer all your doubts about the Sak Yant blessed tattoo and Chiang Mai? Are you ready to do it? Or you think we crazy for doing it? As I wrote in the beginning, I truly believe that the Sak Yant blessed tattoo is not for everyone. You have to commit yourself with an experience that goes beyond our understanding. You have to believe in magic, only this way the blessing will really happen, and your will feel it! I have looked into bamboo tattoos when I was in Thailand, but that sound like a complete different experience. Thank you for sharing your experience, it seems to have been a very special part of your journey. It definitely was one of the most powerful moments of our journey! WOW! I’ve never heard of this before so this was such an interesting read. I love the idea and the concept behind these tattoos and I definitely think it would be something I’d consider getting! Pinning this for later! Thank for such a lovely comment!! Tks for mentioning the Dayak tattoo, just Googled and found it really interesting! Wow! It came out beautiful and neat! I have always been interested in traditional tattooing techniques ever since I first got inked. In the northern mountainous regions of the Philippines, there’s a tribe that does traditional tattooing similar to this one in Chiang Mai! I have also acquired a couple of tattoos in my travels across South America. It’s not exactly part of a to-do list when visiting a new country but I think what you did is a wonderful opportunity to learn and partake in the age-old spiritual tradition of the country you are visiting. All the best and happy travels baby! I personally have never felt the need to get a tattoo but I do love how people who do have tattoos always have inspiring and touching stories behind their tattoos. Same for this Sak Yant Blessed Tattoo, I can imagine it was a very special experience! Crazy! His face doesn’t look too blessed! Jokes aside, these tattoos look nice having a cultural significance is also a bonus on top of it. Great way to connect with the locals. But te good energy we felt after the pain was worth! Tattooing is not something I’ve ever been interested in but I can see why people like them. I’m glad you found someone you trusted to get your tattoo in Chiang Mai. Hope you guys are having a good time! Cheers! I’ve never heard of them – what an interesting story! I don’t have any tatoo – I thought of getting one, but I couldn’t decide on what I would want it to mean, and then I was afraid that after some time I could not like what they mean…. Thanks Monica, I’m glad you enjoy the story! I’ve been reading a lot about the Sak Yant tatoo lately and it sounds like such a spiritual experience. I, personally, wouldn’t do it (because of various reasons), but I think it’s great when people decide to commit themselves to the rules. I have many tattoo, but as you said, when you need to commit yourself to some values and try to be a better person it has different meaning. Thanks for stopping by! Wow, what an experience! Thankyou for all of the tips and advice, especially in the section about tattoos and safety – it’s really so important to find someone you trust to undertake something like this, regardless of where you are in the world. Thanks for such a lovely comment Meg! Do a tattoo is not a simple decision, many people end up regretting their tattoos because they didn’t think properly before doing it. The Sak Yant is very meaningful and it was one of the most intense experiences I have in these two years travelling the world. A feeling of peace and blessing that goes beyond explanation. I`m glad you enjoyed our story! I loved this article, I never knew there blessed tattoos that you could get. The designs are beautiful too, tattoos always held meaning for me with its permanence but this takes it to another level. With its guidance to be a better person with a better life? Perfect! Glad that you liked our tattoos and story Mar! Some people called us crazy for doing the tattoo in a such unconventional way… But no regrets at all! Really happy we did and specially for all the talk and time we spent with the monk, such a blessed moment! I looked into this awhile back and thought it was pretty cool! I didn’t actually get one, but the process is pretty amazing. This was such a fascinating article! I had heard of Thailand’s bamboo tattoos, but didn’t now all the traditions and meaning behind them. It sounds like a beautiful experience, especially since you were able to do it together, on your tenth anniversary no less! They turned out beautiful! Thanks for sharing so many details about the process and your honesty about safety. Congratulations! I have long thought about having a tattoo. If I have one, it should be like yours, with meaning and with spirituality and they look so elegant and classic. Love your experience! It took me a while to do my first tattoo (I did when I was 30), and all of them have a important meaning for me. So, every time I look at them, I remember good moments of my life that are inked on my skin! Thanks for stopping by! Happy travels! This.Is.Awesome. I’ve always wanted a tattoo, but not just “a tattoo.” It should have meaning and be something very special. And so, I’ve never gotten one. Recently, I’ve seen much more on special tattoos as this. No plans to be in Thailand soon, but when I do get there, I’m getting one. Thanks for the awesome story! I´m glad you enjoyed our story!! If you come to Thailand do it, a Sak Yant tattoo is a very special experience. Love it guys! Lina and I got our also in Thailand with her cuz. Three bamboo tattoos all at once, it was a travel experience I will never forget. Not just because it’s inked on my back! Travel On! It´s definitely a unique experience, something you won´t forget for sure! Love the photos on your post! What temple did you get it done at? Você acha que vale a pena eu passar 3 dias em Chiang Mai? Ai pensei pegar um voo de Phuket mesmo, acredito que não saia tão caro assim, o que você me diz? Vale a pena sim, gostamos mt de Chiang Mai, tem uma vibe mais relax. Se der organiza teu roteiro para pegar o domingo a noite lá, tem o Sunday Market que é gigante. Dá uma pesquisada em voos no Skyscanner, AirAsia, Nok Air e Lion Air geralmente tem promoções. Obrigada pela dica então já decidi passar três dias por lá. beijos!! Aproveite tudo!!!! E ótima viagem!!! Se precisar de mais alguma dica é só chamar! Love this article! I’m going to be in Chiang Mai on wednesday and I was actually thinking about getting a Sak Yant tattoo. The only problem is that it would be my first and I don’t know if I could handle the pain. What did you guys pay if I may ask? And did it take a lot of time to heal? After Chiang Mai we’re going to the south, to visit some islands so I don’t know if it ‘s that smart to get a tattoo before we get to the south. Anyway, let me know what you guys think! The sak yant healed so fast, no bleeding and in two days it was completely healed. I was amazed by how fast it was, especially comparing to the traditional machine tattoos I had before. The only thing is that you need to wait a few days before going to beach, swim and sunbathing. It’s painful, but it’s also a unique experience, for me the pain was worth it and manageable. About the price, we did with the guys from Where The Side Walks End and on the price was included the transportation and food, so only the tattoo I’m not sure how much it would cost. I recommend you talk with them to get all the info. They were awesome! Have an amazing trip in Thailand. I am going to Thailand in November for the first time, and this is definitly one of the experiences I want to have! One tip is to avoid April-May, it’s way too warm! Check the destinations page out. We wrote several articles about Thailand. I was living in and around Chiang Mai for about two months while traveling on a gap year between high school and college. It was towards the end of our stay and we had one more weekend in Chiang Mai before flying to the next country, and I really wanted to get a Sak Yant. I did my research and decided to go with the safer option of going to a studio. My girlfriend and I flagged a tuk-tuk and we were off. Upon arrival the studio was closed, but the tuk-tuk driver turned around and asked, “Do you want Sak Yant? Twenty minutes outside of city I know where you can get one. ~$10 there and back.” We figured okay, it’s an adventure so why not? 45 minutes and 4 thwarted temples later we arrived at Ajarn Rungs!! I had no idea tour companies visited him and arrived at his back porch studio on the trust of our tuk-tuk driver. I was not so fortunate as to have a translator and our tuk-tuk drivers choppy English was the best we had. After asking about new needles and ink, and getting the best answers I could hope for, I took the risk. My girlfriend helped me choose the tattoo primarily based on how it looks, admittedly. 30 minutes later I was walking out with the Mongkut Kaew (just like yours!) in the center of my upper back. Anyway, I am glad to hear (after the fact) that Ajarn Rung has a good reputation for relative cleanliness. Crazy coincidence, right? What a coincidence! It’s an awesome experience indeed! Choose a tattoo is a very personal decision… I have many tattoos, some custom made others not, the important thing is that you need to be sure of what your a doing and be happy wth the result. I am going to Thailand in November too as volunteer for an association which helps orphans in poor villages far from tourists. I am planing to get a sank yant tattoo. I still do not know where exactly but I will take my time instead of choosing to go to the temple of Wat Bang Phra which is became a “factory”. I read on many websites that the offering is 2000-3000 THB or even USD 250.- (= 8’700 THB) with Lanna Ink Experience ?. I am a little confused with this…because of the huge difference. Hi Christel! Thanks for stopping by! So nice that you are coming over to help in a village, great initiative! The difference between prices is because when you go to the temple [like Wat Bang Phra] you wait for your turn, you receive the Sak Yant and then you give a donation to the monk. When you do the Lanna Ink Experience, you get more than the Sak Yant tattoo. They take you to a local temple, with a local Ajarn that you can trust on the ink and on the clean work, plus a local guide that will help to translate the conversation between you and the monk. You don’t need to queue because it’s a local temple, later you go for a nice Thai meal and a tour around the amulet market in Chiang Mai. 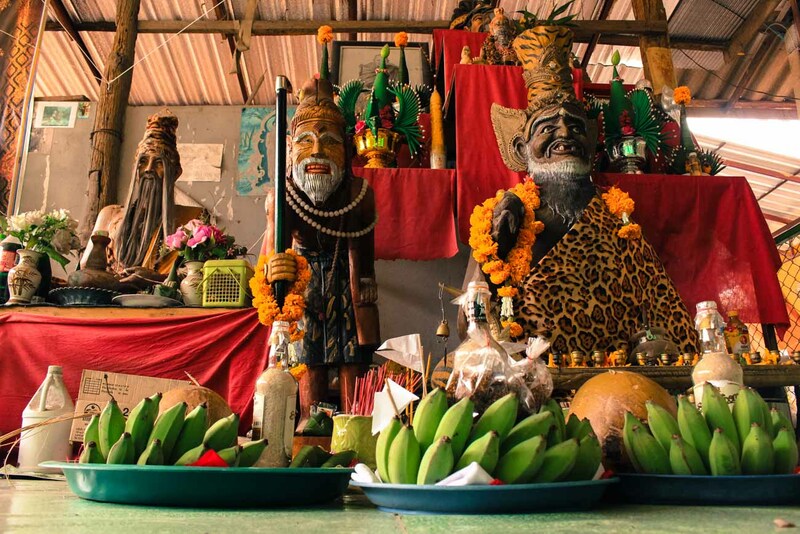 It’s an in-depth experience, with a guide that studies about Lana culture and te Sak Yant, someone that can give you explanations about the ritual. Awesome blog of you sak yant experience! Ever since I learnt about sak yant tattoos I’ve wanted one. Like you said, the most important thing is the meaning of the design and what that can bring to your life. The only hesitation I have is that we are only going to be in Chiang Mai for 5 or so days before moving on, and it’s our first destination. I feel as though it’s a bit touristy to jump off a plane and get a sak yant right away, although it won’t be my first visit to Chiang Mai. I suppose I don’t want to seem ignorant of the culture or like I’m picking up a souvenir, despite my love affair with sak yant tattoos. Could you impart any insight on this worry of mine? As you said Sak Yant is a special experience, a moment of life that will be inked on your skin forever. The good thing is that you already know about the Sak Yant, the meaning of the tattoo, and you are not doing it only to have a tattoo, you really want the full experience. As you already have the knowledge and this is not your first trip to Chiang Mai, I believe there is no harm to do a Sank Yant on a quick stop by Chiang Mai. Also, if you do with the guys from the Lanna Ink Experience you won’t feel like a tourist, they will help to understand the process and enjoy your Sak Yant day. If you really want to do it, come with an open heart and I’m sure will be blessed for life. When are you planning to come? We’ll be in Chiang Mai until the beginning of December. I’m glad to hear that you like the experience and our tattoos. We really like the guidance we receive from The Side Walk Ends, and how the experience was unique and memorable. I am thinking of getting a Sak Yant tattoo in Thailand. I have been here for about a year now teaching and would love to get a tattoo to commemorate my time and experiences here. I love the traditional method of the bamboo (or steal rod) and I love the idea of getting an ancient design. However, I am not Buddhist, nor am I very religious at all. I am spiritual and believe in the power of the tattoo and I love the spiritual experience that goes along with it. I’m just not entirely sure that this is the right choice. Looking for a little guidance.. Sorry for such a late reply, we have been travelling non-stop for the past two months and it has been hard to keep all the email and comments up to date. I believe it’s not about religion, but about feeling the moment and understanding that the Sak Yant is not a simple souvenir you buy during a trip. If you believe on the power of it and if you are willing to follow the main rules [be honest, be good, do good and don’t harm people and animals] there is no problem to do a Sak Yant. I’m not Buddhist neither a religious person, but I do believe in God. And I believe that our feeling and actions are powerful tools to make the world a better place, so the Sak Yant was a important and beautiful moment of my story. Let me know if you decided to do it or not. Hello Natalie, I have a tattoo temple from the bangkok tattoo and I would like to make another one from Chiang Mai, could you tell me where it is and what it’s called the temple? I would like to go on my own, not through a tour. That’s so cool that you already have one Sak Yant and want to do the second. Love the idea!! Thank you for sharing this lovely story and such a wonderful experience. I really want to have that spiritual tattoo very soon, but a bit hesitant about choosing where get it done and who I should contact with. Nat, can you tell me how was your impression with where the side walks end, i am planning to contact those guys about doing the tattoo. Hi! A friend and I are going to Chiang Mai in December and she sent me this article. I would love to get one but my question is, we are headed to south Thailnd (Railay and Phuket) after Chang Mai so if i were to get one, would the aftercare be the same as a studio tatt? Meaning have it covered and no sun for the first few weeks? Sounds like the experience of a lifetime! Thanks for sharing! Yep, te after care is similar to a machine tattoo. Although the bamboo tattoo heals faster. Loved the story! I’m very interested in traveling to get one soon. However, I have an Om Unalome tattoo already on my spine, about six inches, done here in America. I was wondering if the monks would find it disrespectful to have such markings already on my body. To be honest I have no idea… Suggest to drop a msg to the guys at Where The Sidewalk Ends, for dure they will know the answer. Get in touch with the team from Where the Side Walk Ends. I want to try also sak yant tattoo experience in Thailand! Thanks for the info. I’m more motivated now! I’ve been doing muay thai recently and I’ve been seeing these kinds of tattoos. I wanted to get my first tattoo. I think this would be the best way of getting my first, instead of getting one using a machine. Thank you for this article. It’s really a big help.